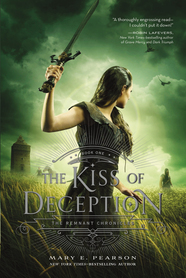 The Kiss of Deception (The Remnant Chronicles) by Mary E. Pearson. Henry Holt & Co. 2014. Reviewed from ARC. The Plot: Princess Lia runs away from an arranged political marriage. She finds a small village to live in, finds a job and a place to live, and embraces her non-royal life. Two men are following her: one, the jilted prince. The other, an assassin. The Good: I'm sorry to say that I read this over a year ago, should have blogged it then, but didn't. But I loved it so much I didn't want to just say "oh, too late now." Lia does something selfish, by running away and abandoning her obligations to family and country. But so what? Seriously. Lia isn't asking for much -- she has no say in her future, her spouse, no choice at all. All her choices have been taken away from her. So she runs. So she needs time to figure out who she is and what she wants. She needs time. Meanwhile, there are the two following her: one, a prince who is upset about her leaving and who recognizes that the marriage is of political necessity. The other, an assassin loyal to his own and whose job is to make sure that political marriage doesn't happen. Here's the thing: while the reader knows one is a prince, one is an assassin, the reader doesn't know which of the young men we're reading about is which. Is Lia falling for a prince or her killer? Is the prince or the assassin falling for her? I kept on going back and forth with my guess. What else does this have? Twists! Adventures! Turns! Questions! Cliffhangers! Romance! Secrets! Betrayals! Death! And yes..this means it's a Favorite Book of 2015.